37 hotels with a sea view are waiting for you in the Bay of Cannes, Antibes. 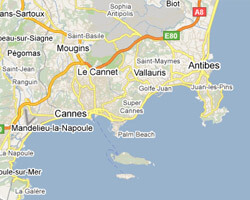 Cannes Bay and Golfe Juan are located between the Esterel mounts and the Cap d'Antibes. Lérins Islands are offshore. On this coastline liked by movie stars, yachts are lazing, savouring the sweetness of days. At the seaside you can beautiful sandy beaches lapped by clear waters. It is a pleasant destination lively throughout the year. In Cannes Bay enjoy the pleasure of a sea view hotel.